Ke Jie 9p defeated Lee Sedol 9p in the final game of the 17th Nongshim Cup on March 5, enabling Team China to take the Cup back home for another year. While Korea has dominated this event, winning it 11 times, China now has five wins; Japan has won it only once. The Nongshim Cup is a team event between China, Japan and Korea, sponsored by the Korean instant noodles company. Lee Sedol had scored three consecutive wins, beating Gu Li, Lian Xiao and Iyama Yuta. The match against Ke Jie was Lee’s fourth in as many days and though some worried that he’d be tired going into the final round, others said it was a great opportunity for Lee because of his form’s sweeping upturn. 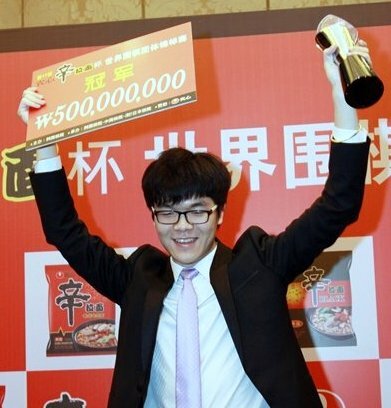 Although Ke Jie was the last man standing for China, his head-to-head record against Lee was 7-2 and he demonstrated a superior sense of balance in the Nongshim final, resolving a tense middle game with a trade and employing his excellent endgame technique to close out the win. - adapted from a longer report on Go Game Guru, which includes more details, game commentaries and more photos. Can machines overtake human intelligence? A breakthrough moment for that answer may come this week when the world champion of the ancient board game go takes on an AI program developed by Google. 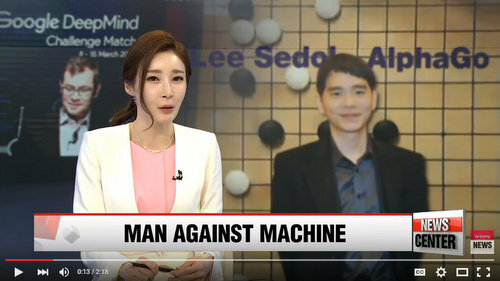 Korean Lee Sedol and AlphaGO will go toe-to-toe in the ultimate man versus machine battle. In this Arirang News video, Kim Ji-yeon reports on how the human champion thinks the match will play out. 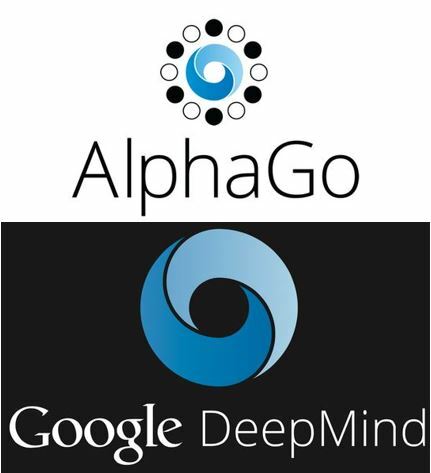 The go world was shocked and intrigued in January, when news broke of DeepMind AlphaGo’s victory over top European pro Fan Hui 2p. Since the publication of DeepMind’s paper in Nature, and the release of the game records, professionals around the globe have had time to analyse AlphaGo’s play in more detail, and a consensus has emerged that although AlphaGo’s victory over top European pro Fan Hui 2p was a great advance in computer go ability, DeepMind would not be celebrating victory if it had been a top professional sitting across the go board back in October. This week we’ll find out. - adapted from reports by the Arirang News and Go Game Guru. The first game will be Tuesday, March 8, 8p PST (11p EST). 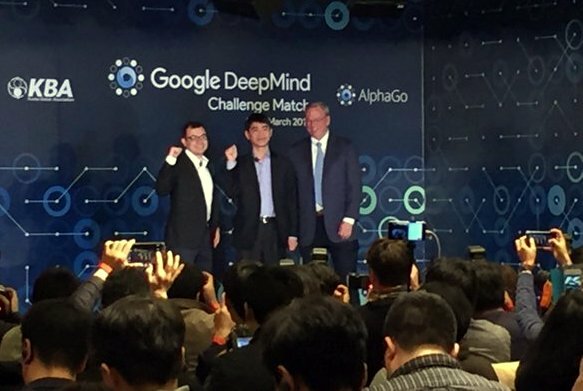 The match will be livestreamed on DeepMind’s YouTube channel with English commentary by Michael Redmond 9p with American Go E-Journal Managing Editor Chris Garlock. Your Move/Readers Write: Where to find the AlphaGo-Lee match? The local US times for the upcoming AlphaGo-Lee Sedol match are 8p PST and 11p EST. The first match will be Tuesday, March 8. 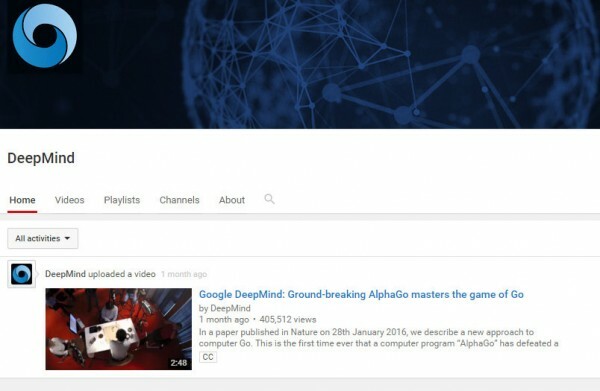 The tournament will be livestreamed on DeepMind’s YouTube channel with English commentary by Michael Redmond 9p with American Go E-Journal Managing Editor Chris Garlock. It will also be broadcast on TV throughout Asia through Korea’s Baduk TV, as well as in China, Japan, and elsewhere. More details on the SmartGo website. 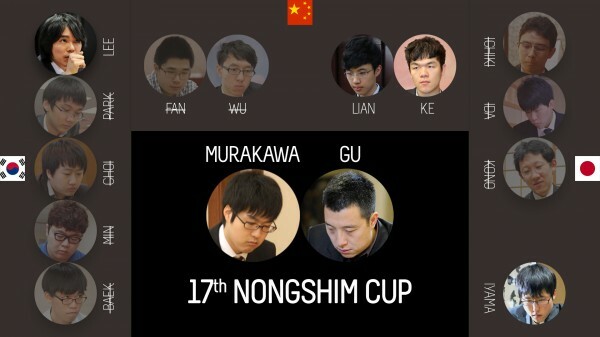 Myungwan Kim 9P will be providing live commentary in the Nongshim Cup starting Tuesday, March 1st. The game will begin at 10p PST (1a 3/2 EST) and commentary on the AGA’s YouTube channel will begin at 10:30p PST 1:30a 3/2 EST, UTC-8). The Nongshim Cup is a win-and-continue team match between Japan, China, and Korea. On Feb 29th, Gu Li — on a 3-game winning streak after beating Choi Cheolhon, Kono Rin, and Park Jungwhan — will face Japan’s next player, Murakawa Daisuke. Lee Sedol will face the winner of that match up, and the AGA will continue to broadcast games as long as Lee keeps winning; the remaining games are scheduled for March 2nd, 3rd, and 4th. AlphaGo will play Lee Sedol in a five-­game challenge match to be held from Wednesday, March 9 to Tuesday, March 15 in Seoul, South Korea. The games will be even, with $1 million USD in prize money for the winner. If AlphaGo wins, the prize money will be donated to UNICEF, STEM and go charities. 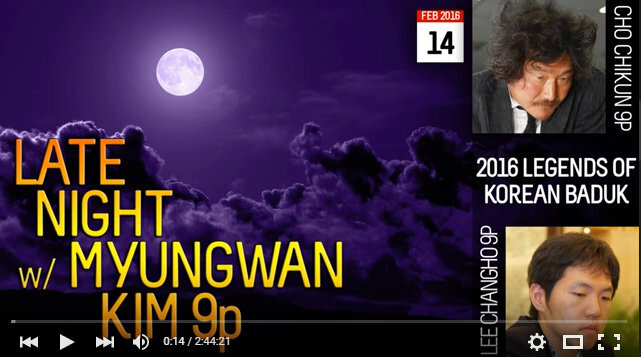 If you missed the February 14 livestream of “Lee Changho 9p vs Cho Chikun 9p, the LEGENDS OF BADUK FINAL ROUND” you can catch it now on the AGA’s YouTube Channel. 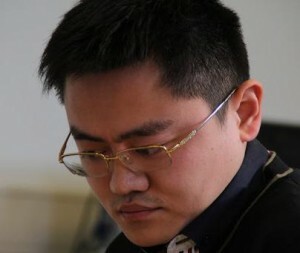 Lee Changho plays Cho Chikun (Chihoon), in the last round of the LEGENDS OF BADUK tournament featuring the greatest Korean players of the ’80s and ’90s; Myungwan Kim 9P comments, with Andrew Jackson. 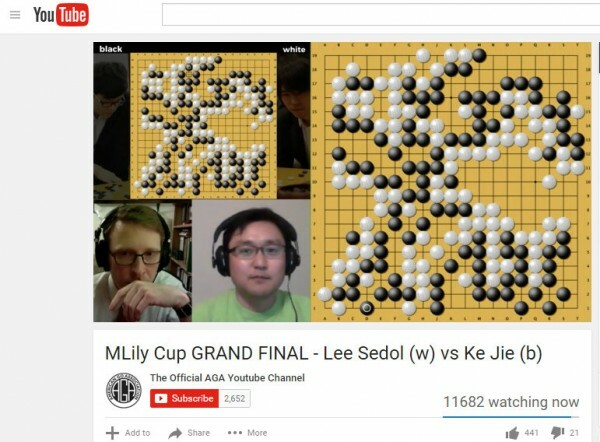 Ke Jie 9P edged out Lee Sedol 9P by the narrowest of margins — a half-point — to win the MLily Cup Monday night in a dramatic deciding fifth game that drew a record number of viewers to the AGA’s YouTube channel, where Myungwan Kim 9P and Andrew Jackson provided blow-by-blow commentary to a nailbiting audience that hit just over 14,000 at its peak, far surpassing the previous record of 400 viewers. The winner collected not just this year’s MLily international title and a purse of over $300,000, but bragging rights in the classic showdown between two go titans, one a seasoned veteran from Korea, the other a young rising star from China. The battle see-sawed back and forth, taking fans of both players on a wild ride, and went on until just past midnight on the West Coast, drawing intense attention worldwide — especially in Korea and China — and the AGA’s broadcasting efforts, anchored by Kim and Jackson, brought the match to a much broader gaming audience on YouTube and Twitch. A report on Myungwan Kim’s commentary was also featured in the Chosun news, helping to drive thousands of Korean viewers to the AGA’s YouTube channel as well. The coverage even inspired one viewer to donate to the AGA. “I had such a blast on the live MLily Cup Game moderated by Andrew Jackson with the Myungwan Kim 9p comments) that I just donated $50 to the org, this is truely awesome!” wrote Indigonauts. “This is amazing that I can watch a professional #baduk match in English now. Thanks @theaga,” added Christopher Annanie on Twitter. The AGA broadcast team also included Kevin Hwang, Peter Nelson, Steven Hu, Nick Sibicki, and more (we’ll update this more completely asap).